Demonetisation was absolutely necessary. It was necessary to put the brakes on growth of cash in our economy. Like in 2014, a Modi wave is sweeping across the country, this time, resting on the achievements of the last five years. 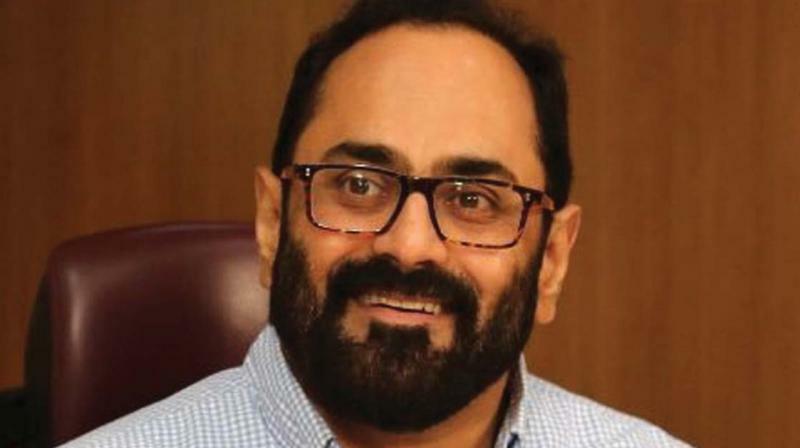 Whether it is measures to root out poverty, improve conditions of farmers, turning a shattered economy into one of the world's fastest growing economies - the NDA has plenty of laurels backing it, says Rajya Sabha MP Rajeev Chandrasekhar. 'Modi wave' was the mainstay in 2014 Lok Sabha elections. Many leaders and analysts are claiming there is 'No Modi wave' in this election? In some states it is 'Anti Modi wave'. Will PM Modi's wave be seen again? There is a very definite, very wide, pro-incumbency for Prime Minister Narendra Modi in 2019. It is different from the wave we experienced in 2014, for now, he is offering his performance over the last five years – personal integrity, rebuilding a shattered economy and banking system, cleaning out corruption from the central government, a new, decisive security doctrine and creating a leak-proof architecture to ensure direct delivery of subsidies to the poor and to farmers. He has launched a new approach to the 70-year-old problems around poverty and the farming community. Congress President Rahul Gandhi often targets the Prime Minister’s reluctance to give interviews. Mr Gandhi, who always takes questions from the audience has asked, on several occasions, how many times the PM has been open to questions from the public or the media. How do you see this? Rahul Gandhi loves press conferences for a simple reason - that’s where most of his lies get launched. He now has at his repertoire a long list of lies launched at press conferences over the last five years. He needs the media for his politics. PM Modi is a man focussed on his work and believes that his work-record will do the talking. He communicates directly with the people, whether they are party workers, youth or regular citizens. I tend to believe that in a vibrant democracy like ours, that direct access between the people and their leader is more important than media PR or intermediation. You can’t deny, also, that the liberal media has a long history of being biased and unfair vis-a-vis Narendra Modi. You said that the former PM Manmohan Singh's charge of jobless growth is factually wrong. One of the key promises of BJP which led to its victory was creation of jobs at the rate of one crore jobs per year. Has the Modi regime created enough jobs it promised? Are enough jobs created to fully realise the potential demographic dividend? Firstly, India has no jobs data in any formal sense. The informal or unorganised sector accounts for 80% of all jobs in India. The fiction of jobless growth is simply political fiction, another bogeyman invented by Congress in keeping with their ongoing narrative: EVM fraud, Judge Loya, Rafale, etc. The Economy has seen record FDI and public investment in infrastructure, amounting to almost 10 lakh crores by the government alone in Rail, Road and Ports. Housing for poor is at record levels - all these are job creators. There is evidence in terms of private sector jobs with EPFO data pointing to significant expansions in this sector. The Congress has based its fiction on the 2017 NSSO Survey, which Montek Singh Ahluwalia referred to as unreliable in 2011 and again in 2013, as it is merely a statistical survey. Second, this survey was conducted in the aftermath of demonetisation and GST. Both reforms had a short-term impact on the informal sector and MSMEs. This was why the 2018 budget focussed on supporting both these. A survey conducted during a time of change and transformation, it will reflect those distortions. The right time for a survey, if the intent was to be reliable, would have been in 2018 or 2019. On what major issues are the 2019 elections being fought? Also elaborate on the scenario in Karnataka. RC 5) The issue is simple - do people of India want to continue along the path of development and opportunities for all, towards being a secure nation with a fast-growing economy under the incorruptible leadership of PM Modi? Or do they want to return to another 10 years of corruption, dynasty politics, crony capitalism and populist measures that don’t even reach the poor but contribute mainly to inflation? Do we want a nation where commercial capital is vulnerable to terror attacks? The choice for 2019 is simple. Karnataka voters have in particular an interesting opportunity to speak up. The rest of the country may have forgotten UPA’s dubious legacy but the consequences of six years of Congress rule in the state are fresh in our minds. The Congress regime was marked by corruption, mal-governance and caste politics. In 2018, despite a rejection in the Assembly elections, the Congress created an opportunistic alliance with JD(S) to form a coalition in which neither party had the people’s mandate. That coalition has, in the last 12 months, done nothing but loot the people through contracts. Voters are wise and will speak against such shameless politics in this election. Leaders of opposition say 'demonetisation' and 'GST' were disasters of Modi? Is that so? No. I was on the GST select committee. GST is the biggest indirect taxation reform since independence. It creates a seamless market, easier compliance and in the medium term gives small and medium businesses access to consumers and markets all over India -without the worry and costs of multiple tax compliances. It also makes tax evasion difficult and creates a culture of honesty and compliance in business. Over time, as more and more businesses register - GST revenues will grow and tax rates will come down. Yes, there were transitional issues in implementation but any transformational reform has some short term disruptions. Demonetisation was absolutely necessary. It was necessary to put the brakes on growth of cash in our economy. This high cash-to-GDP ratio was creating many known and unknown issues on economy and other factors. It was a necessary reform because of 10 years of mal-governance by UPA. Narendra Modi wants a clean and compliant economy and believes that in medium term economy benefits from more cashless transactions and growth in formalisation of jobs as well expanding tax-GDP. As data shows now - significant expansion of tax net and formal jobs have resulted post demonetisation. What, according to you, are the major achievements of the Modi regime? He has done more in five years than governments do in 25. Firstly, he took a shattered, tottering economy with galloping inflation, deficits and low investor confidence and turned it around. A once-broken economy now is among the fastest-growing in the world. He rebuilt the broken banking system and changed the culture of crony borrowers not repaying debts. Finally, personal integrity has become part of political leadership. PM Modi has restored the people’s faith in political leadership and the government. Almost 5.5 lakh crores per year is being spent on the poor, in the leak-proof, corruption-free architecture of the Jan Dhan Yojana, through which money and benefits reach the beneficiary directly. He has changed India’s security doctrine from the UPA’s do-nothing strategic restraint to one where those who perpetrate terrorism recognise the cost. He has modernised the armed forces and increased make in India initiatives. His achievements are many, including the transformation of a 65-year-old economic model that once depended on a few big industrial groups and PSUs as engines of growth, to one where growth stems from a lineup of thousands of small, young entrepreneurs, MSMEs, large companies, MNCs and lakhs for Mudra or informal entrepreneurs. Q Rahul Gandhi loves press conferences for a simple reason - that’s where most of his lies get launched. He now has at his repertoire a long list of lies launched at press conferences over the last five years. He needs the media for his politics. PM Modi is a man focussed on his work and believes that his work-record will do the talking. How do you see Priyanka Gandhi's entry to politics? Is Congress pulling out the stops to make Rahul PM? Why do you feel Congress will be reduced to a regional party after 2019? Priyanka, Rahul, Sonia – they all represent one thing: a dynasty that allows people who haven’t worked a day in their lives being fastracked to the top of a national party simply because their grandfather or father was once at the helm. The family is neck-deep in corruption and deals with many people accused in scams. Young India wants to compete in the world on merit and achievement – this family is a shame and embarrassment to our politics and democracy. Rahul says he has chosen Wayanad as people from South India feel they are neglected? Is that the real reason? Does he mean that all those Congress MPs that represented constituencies in Kerala including A.K. Antony are incompetent or inept? I knew Shahnavas the former MP who represented Wayanad. He was a thorough gentleman, who I was proud to call a colleague and friend in Parliament. Is Rahul suggesting he neglected Wayanad? Rahul Gandhi is running to a safe seat Wayanad. He can put out any spin he wants but no one, not even his own party, will buy it. Rahul thinks Muslims and Christians will vote for him because he has fed them lies about Modi. I think he will be surprised to find that silly politics don’t work in South India. Congress party has released its manifesto with big promises. When is BJP planning to release its manifesto? What are the major promises likely to be? The Congress manifesto is the mark of a desperate Rahul Gandhi making desperate promises. It pivots Congress to the extreme left, especially in its approach to economy, armed forces and criminals. His NYAY is a financially unviable, economy-breaking plan and is a desperate attempt to shift narrative away from scrutiny of his personal financial corruption. You will have to wait just a bit for BJP Manifesto. Unlike the Congress with a 65-year history of broken promises, the BJP has delivered upto 98% of its 2014 manifesto. The BJPs commitment and promises are real and will be based on continuing and expanding its core objectives of better lives for poor, farmers, middle class and youth. How do you see the Mahagathbandan? Many regional parties in Tamil Nadu, West Bengal, Andhra Pradesh and Karnataka want to throw BJP out. Will they succeed and install Rahul as PM? The Congress is and will be the B team of the Mahagatbandhan. The Congress will not do well anywhere in the country except perhaps Kerala, and even that is because of the Left being in power there. As I said before, the issue for voters in these elections is simple. Who should be India’s Prime Minister - Narendra Modi, Rahul Gandhi or Mayawati or Mamata? As I said earlier, voters of Karnataka know what they have experienced in the last six years at the hands of a Congress government. I see the people of Karnataka overwhelmingly supporting BJP.